Crispy, Spatchcocked, Duck Fat Roasted Chicken. There probably isn't anything in the realm of home cooking that once frustrated me more than learning how to roast a whole chicken. It's something everybody expects good cooks to know. And yet, every recipe I read promised the world with minimal effort. Nobody warned me that there would be dry, overcooked breasts or embarrassingly raw thighs. I didn't foresee how difficult it would be to avoid pale chickens, underseasoned chickens, boring chickens. For something supposedly so simple, there were seemingly endless ways to mess it up. To make matters more questionable, there isn't a grocery store around that doesn't sell a plethora of hot, cooked rotisserie chickens. So why work so hard at learning to roast one myself? As I hope you'll soon discover, it's because a properly roasted chicken is everything that bird crossed the road to become. When I finally got it right, I realized what I'd been missing all these years. Now I love knowing how to achieve juicy white meat that's seasoned throughout, dark meat that's damn near falling off the bone, crispy crackling golden brown skin, and the indescribable savory lusciousness that duck fat brings to the table. Sometimes I feel like my credit score isn't high enough to enjoy chicken this rich. But I do it anyway. It's the kind of precision and perfection that can't be bought in the deli section of your grocery store. I actually prefer (my) roasted chicken to fried chicken at this point. Much less work, far more rewards! As it turned out, there is a little more work involved with a perfectly roasted chicken. Nothing difficult, and in my experience it's worth making the extra effort. 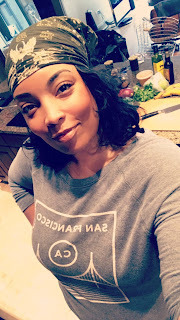 (If you've followed my blog for awhile you'd know I'm not here for lazy cooks.) The steps I recommend taking are below, for those interested in the nitty gritty details. Otherwise, the full recipe follows if you scroll down below! If you want a whole chicken to cook evenly, your best bet is to butterfly it prior to roasting. But "spatchcocked" is an infinitely more delightful way to say that. All it means is to cut out the backbone from the chicken so that it can lie flat. Years ago, I first saw barbecue pros suggest this technique for the grill. Now it's pretty common to see chefs oven roast whole birds this way; I even spatchcock my Thanskgiving turkeys. Spatchcocking helps to keep the chicken breasts from cooking faster than the rest of the chicken, as they are usually sitting up higher in the oven. When the bird is flat on a roasting pan, it all cooks evenly, and faster at that. Flavor is improved by an overnight dry brine, so I season the whole chicken with salt and pepper (plus other spices, if desired; but salt is really what actually penetrates the meat.) I make sure to get the seasonings under the skin of the breasts, and rubbed into the underside of the chicken. Once it's seasoned, I let the chicken air chill in the fridge. At least an hour for every pound of chicken but overnight is best. The time in the fridge also gives the skin a chance to dry out. Dry skin equals crispy skin. 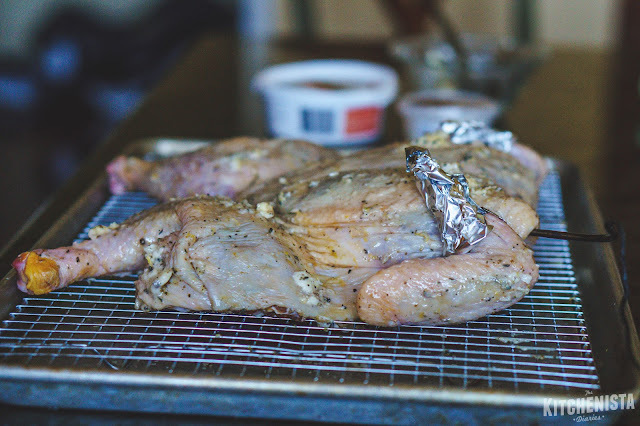 I am a fan of the dry brine these days versus submerging the chicken in a saltwater brine, the original way I learned to do it. 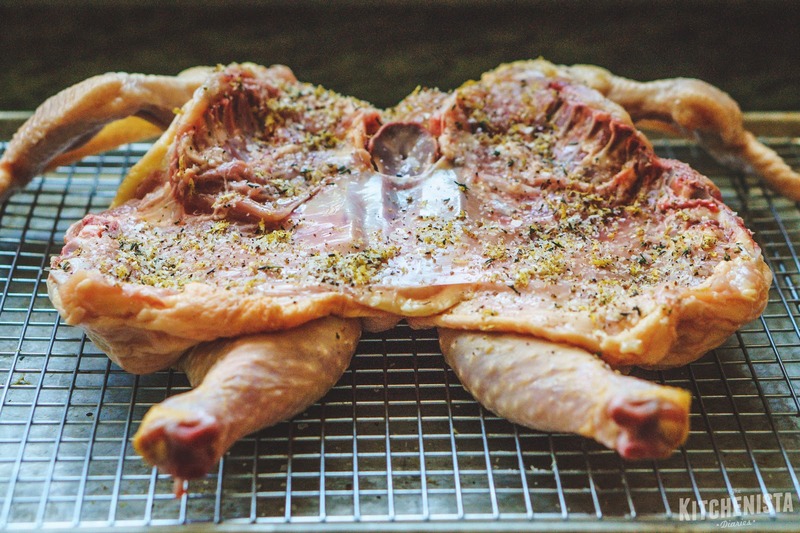 To maximize the crispiest skin possible, I rub the bird down with a combination of duck fat and clarified butter, then roast it under high heat. I use clarified butter because it won't burn so easily under high heat, but also because I usually have it on hand for Whole30. It's not a deal breaker if you use regular butter. More importantly, duck fat makes everything better. Trust me. It adds a rich, savory flavor plus it works miracles for crispy chicken skin (and potatoes, but that's another post.) If you want to be boring and use all butter without the duck fat, I suppose that's fine too. Your chicken will be average as hell but that's no longer my problem. All jokes aside, don't waste your good extra virgin olive oil, as it's not ideal for high heat applications like this. Finally, to make sure the meat doesn't overcook, I keep a probe thermometer in the chicken while it roasts so I can monitor the internal temp without constantly opening the oven. 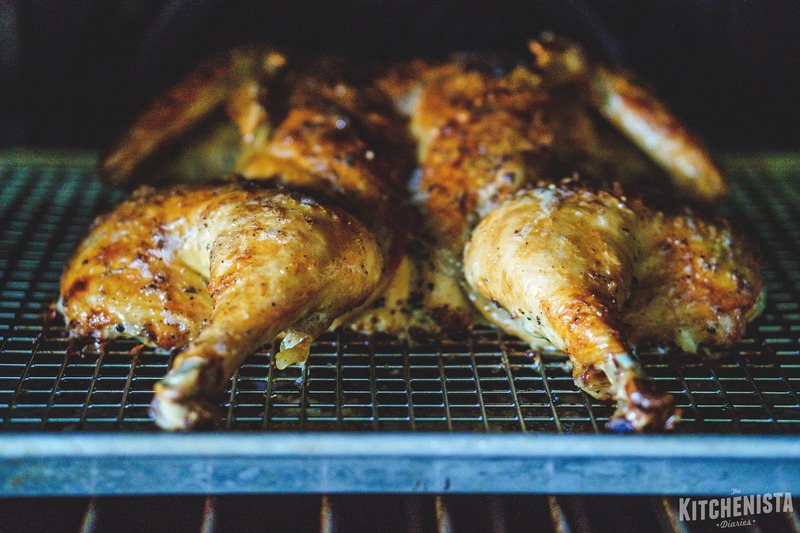 Thighs need to reach at least 165°F but it's actually better if they get much hotter - that's not hard to do at the high roasting temperature. What you don't want is for the breasts to go past the 155° to 160° zone. Yes, it's slightly under USDA recommendations, but residual heat will continue to make the temperature climb after the chicken leaves the oven. If you stop cooking it at 165°F, you'll actually end up at around 170°F or higher, which results in drier, overcooked white meat. Provided the thighs have reached a safe temp, pulling the chicken when the breasts are approaching 155°F is perfect for juicy meat without risking any undercooked parts. I roast a chicken about once a week nowadays. It's something I can practically do in my sleep, so it's funny looking back at what caused so much stress in the past! 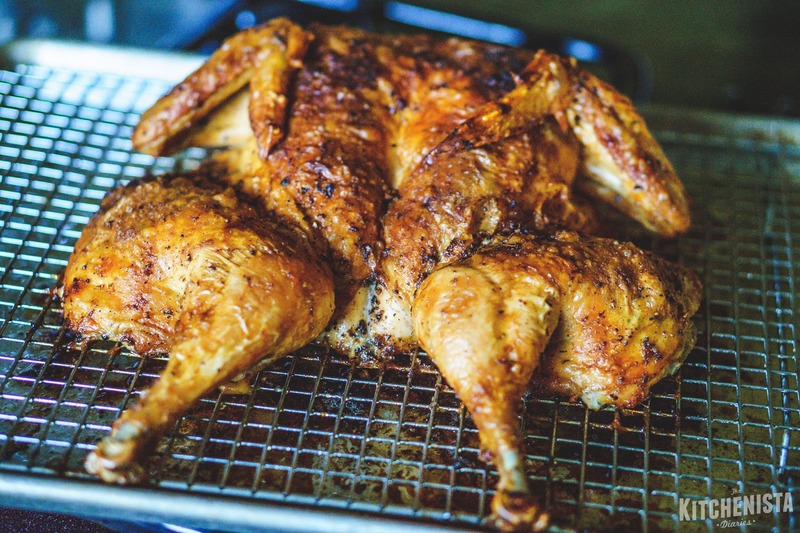 As written below, my roasted chicken recipe is paleo friendly and Whole30 compliant. As always, source the freshest poultry you can find. I recently started buying my whole chickens from a local farm. Besides supporting local business, it's nice knowing I'm getting a healthy chicken that was processed just a couple days before I bought it. If you're buying whole chickens at the grocery store, look for those labeled as "air-chilled" when possible. Those chickens taste fresher and the skin isn't water-logged, so it crisps up much better. One last thing. This technique is what you should be practicing for Thanksgiving. You can cook a turkey in the same way, it's just a bigger bird to handle. Of course, there are some extra tricks to add to your process if you want to do things like collect the drippings for a good gravy. You lose the classic Norman Rockwell picturesque roasted turkey presentation, but honestly - is your goal to replicate a painting from the 40's or is it to serve properly cooked poultry? That's what I thought. And if you're really concerned about presentation, focus on how you carve the bird. I've made some beautiful presentations from spatchcocked birds. I'm wrapping up my new Thanksgiving ebook for release later this month, with all the details you'll need about spatchcocking turkeys! In the meantime, your assignment: Roast a chicken every weekend. Seriously. 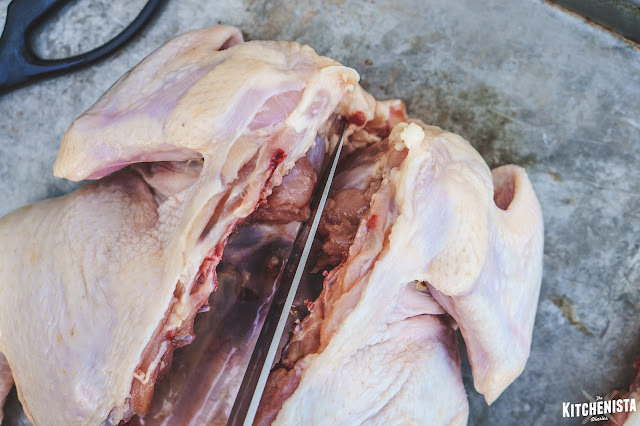 Good practice, you'll be able to freeze a surplus of bones to use for stock, and roasted chickens are an easy option to feed a family or provide several portions of meat for meal prep. Take photos of your roasted chickens and tag them with #kitchenista so I can check out your progress! *Look for duck fat at your local butcher, farmers' market, gourmet grocery store section, or purchase online; many commercial brands will ship duck fat. It can be sold refrigerated or on the shelf. 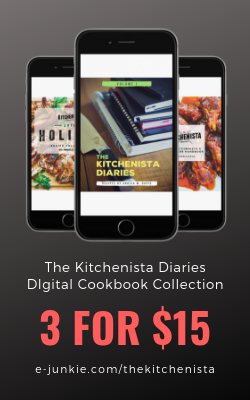 Special Equipment: heavy duty sheet pan, oven-safe baking rack, silicone basting brush, poultry shears and/or a good's chef's knife, remote digital probe thermometer and/or instant read meat thermometer. 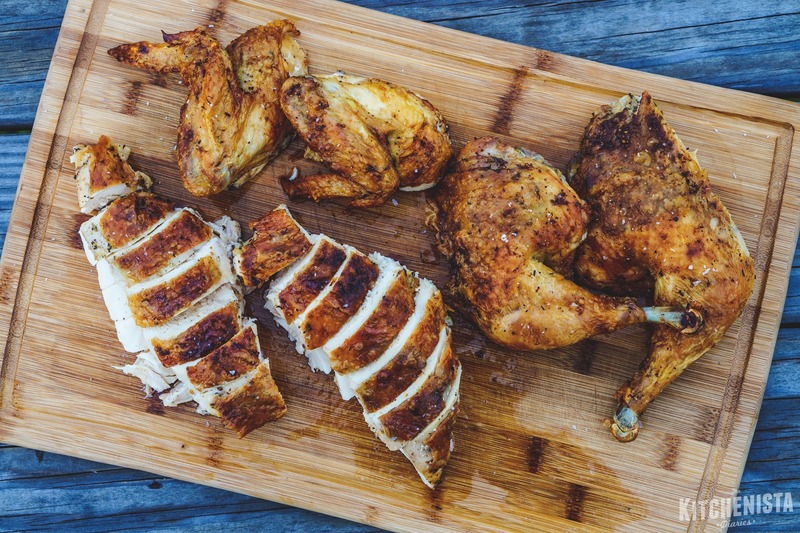 You don't need to dirty up a cutting board to spatchcock a chicken, it's that easy. 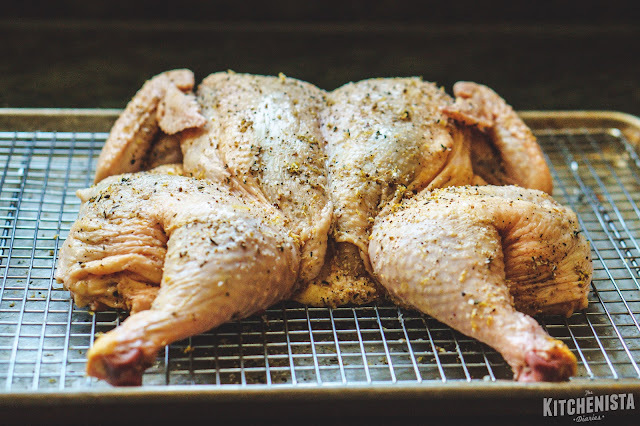 Before touching the raw chicken, prepare your dry brine by combining the salt, poultry seasoning, black pepper and lemon zest in a small dish. Rub it between your fingers to release the oils in the lemon zest. Place your chicken on a heavy duty sheet pan (not a cookie sheet - heavy duty folks.) Pat the chicken dry with a paper towel. Flip the bird over so you're looking at the backbone. Use poultry shears to cut along one side of the backbone from the neck to the tail. Cut along the other side, removing the backbone completely. You can freeze your backbones to save for chicken stock! Next, use your knife to cut a small slit above the breastbone. Open the chicken up like a book. 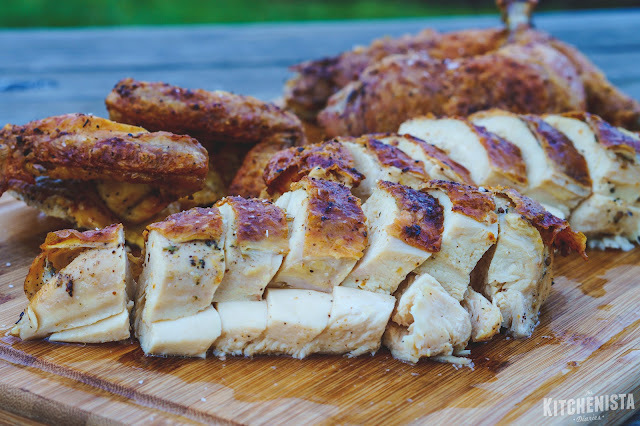 With one hand on each side, press the whole chicken down firmly against the pan so it lays flatter; the breast bone should pop out a little. You've just spatchcocked a bird! Now you can slide that cooking rack under the bird. It'll help let air circulate and liquid drip down while the chicken chills in the fridge later. (Make sure you have a cleared shelf ready to go that the pan can fit on.) Season the underside of the chicken with half of the dry brine, rubbing it into the flesh. Flip the chicken over. Get some of the dry brine underneath the skin of the breasts. You should be able to gently slide your fingers to loosen the skin, opening up some space to season it there. If you'd like, you can put a few pats of butter under the skin as well. Now rub the rest of the seasonings all over the bird, making sure to get the wings and in the crevices of the thighs. The whole pan can go into the fridge, uncovered, for at least one hour per pound but preferably overnight. If you need to let it sit for more than 24 hours, cover it loosely with plastic wrap so it doesn't dry out too much. When you're ready to roast the chicken, remove the pan from the fridge. Preheat the oven to 475°F and arrange a rack in the upper third of the oven. Scoop the duck fat and butter into a small dish so you don't contaminate those containers. Smear the whole chicken with about half of the duck fat and butter mixture, reserving the rest. 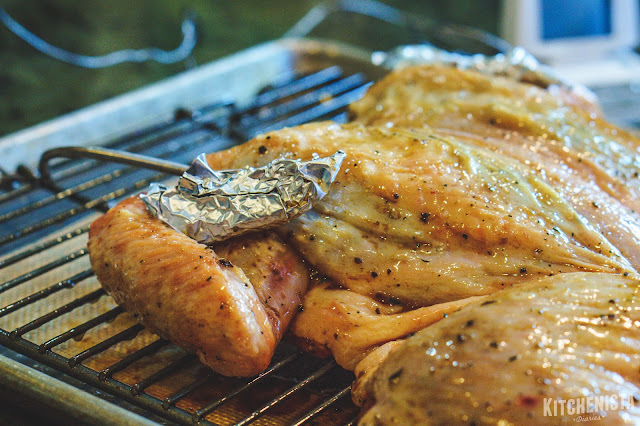 Cover the wing tips with foil, or fold the wings back and tuck them underneath the chicken breast. 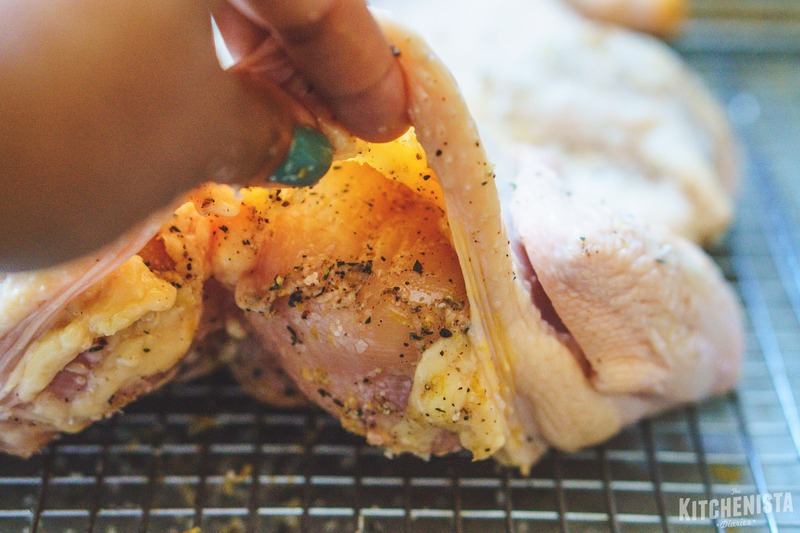 Stick the probe of your thermometer into the fattest part of the chicken breast, making sure it's not hitting any bones. 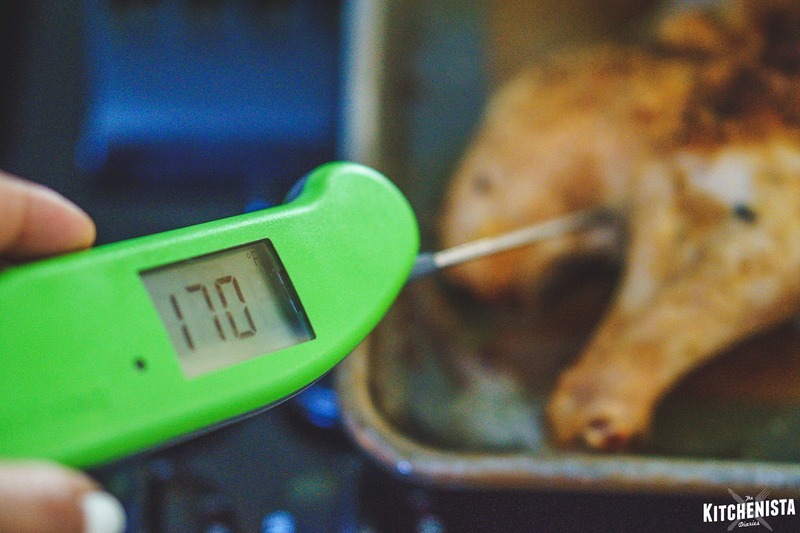 Set your probe thermometer for an alert when the chicken reaches an internal temp of 125°F. That's going to remind you to pull it out to baste halfway through, it's not the final temperature! Roast the chicken, and when the internal temperature reaches 125°F, remove the pan from the oven. 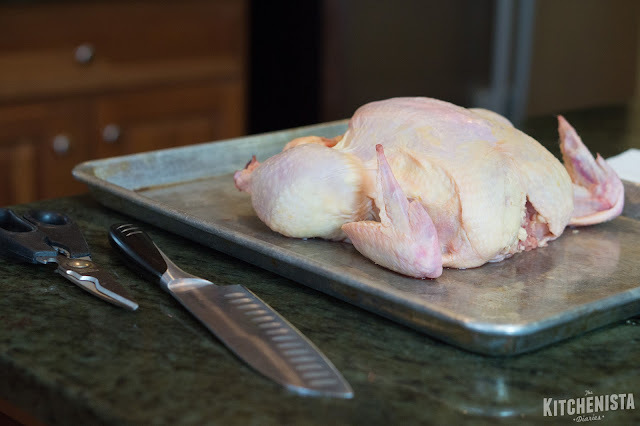 Always transfer the chicken back to your counter (use trivets to protect it from heat.) This way you can close the oven and don't allow heat to escape. Baste the chicken with the remaining duck fat and butter mixture. (Easiest if you melt the duck fat and butter, then baste with a silicone brush.) If you can safely drain whatever drippings have collected in the pan, feel free to add that to your basting mixture. When the chicken is finished cooking to perfection and you've removed it from the oven for the last time, let it rest. This gives the juices inside a chance to redistribute. 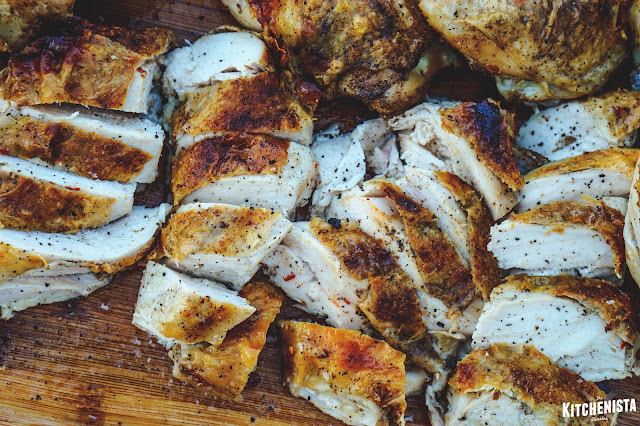 Cut it too early, and your chicken will dry out, especially the breasts. Ten minutes is plenty of time for a bird of this size. When it's cool enough to handle, transfer it to a cutting board. Spatchcocked chickens are pretty easy to carve because of the way they're already opened up. 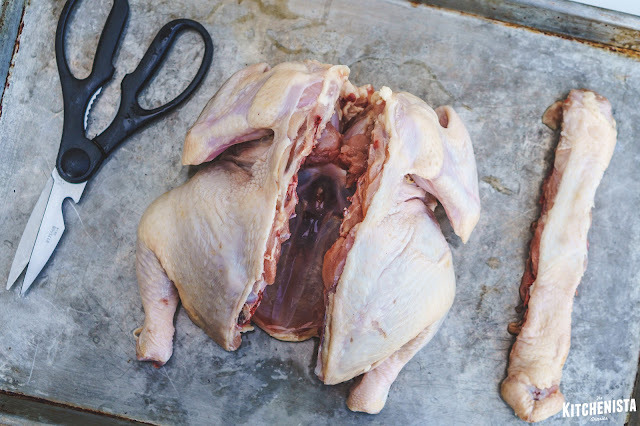 If you're serving four, you can simply cut the bird into quarters (2 quarters with a breast/wing, 2 quarters with a leg/thigh.) 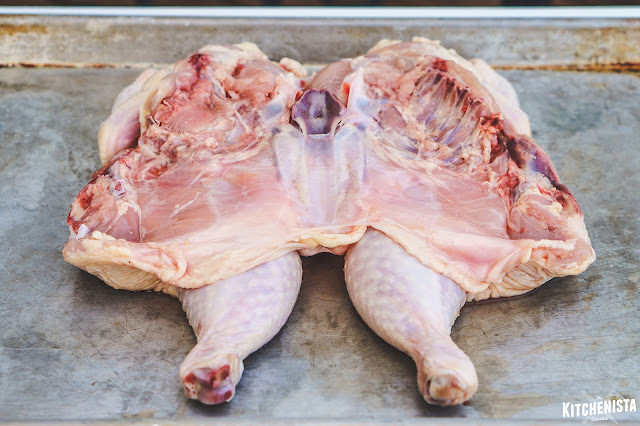 If you want people to be able to choose a combination of white and dark meat, you can take the additional step of separating the wings from the breast and separating the thighs and legs. I often go ahead and pull the breast bone, ribs and any cartilage off of the breasts, then slice it for serving. It's hard to believe the picture above was roasted and not fried. That is the power of duck fat! This was a lengthy tutorial, but as you can tell I'm pretty passionate about my chickens. 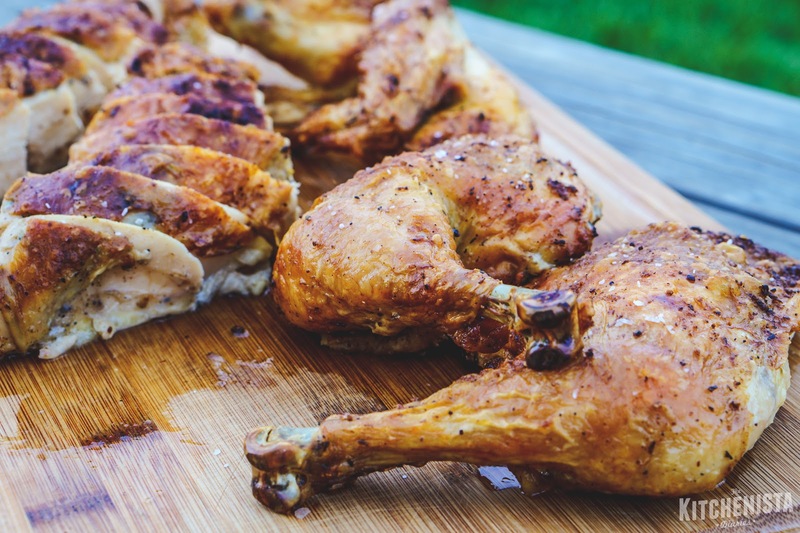 I hope you'll discover the joy that I found in stepping up my roasted chicken game by using these tips! Oh my, does this look succulent! Thanks so much for the tutorial and all the info. I'm definitely going to try one this weekend and will practice so maybe I'll do a turkey for Thanksgiving! So glad I found your blog. Your recipes look amazing. Making this on Thanksgiving! Got my duck fat this past Saturday. Can't wait to taste it.